It’s the first of November, which means National Novel Writing Month. I haven’t participated in four years or so, because I’ve typically been under some deadline or another and haven’t had the time or energy to devote to this sort of group insanity. This year, though, well, I’m not under deadline (for the first time in three years), and I don’t have any active projects under contract. I do, however, need to get back into the regular practice of writing every day as I’ve been remiss lately. So, yeah, Nanowrimo for me this year. What’s the goal again? 60K? How does this thing work? Anyway, I’ve got a profile over there. Tag me as a writing buddy if you like. It’s new Foreworld book day around here. 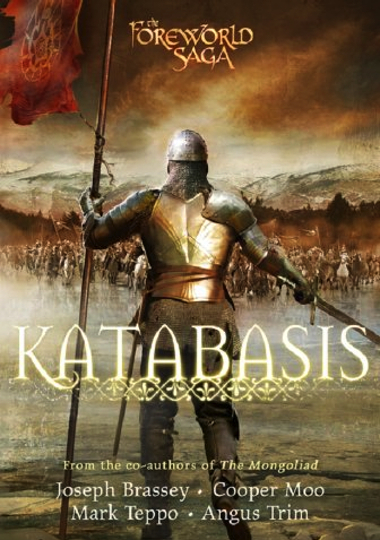 This is Katabasis, the fourth volume in The Mongoliad Cycle, and the one that I will look back upon as being one of my favorites. The three volumes of The Mongoliad were a thrilling rollercoaster ride, but Katabasis holds a special place in my heart because it’s the book where there’s a lot of payoff. Not just for those who have been following The Mongoliad, but there are a number of little rewards for those who have been reading the SideQuests as well. Everything comes together—for me, at least—in Katabasis. There’s one more to follow. Siege Perilous, written by our favorite stand-in, E. D. deBirmingham. There are a few loose ends regarding the Church and a mysterious cup that need resolving . . . While we’ve been tumbling toward this date, I’ve been quietly getting things done on the Resurrection House front. The latest news post takes about getting distribution taken care of (PGW, for those who are following along), as well as news of a few acquisitions: two books by Darin Bradley and one by Forrest Aguirre. Fall 2014 is starting to shape up nicely. Now, to do editorial letters, source cover art and design, get the books into the system, and start the marketing machinery. Ah, there’s nothing like the “can do!” entrepreneurial spirit.